Protecting your home from weather elements such as rain is what your roof is designed to do. However, sometimes the roof gets damaged in some way and a roof leak begins. Once a roof leak starts in your home it can cause lots of damage to the interior of the home. Not just to the home components itself but also to home furnishings inside the home. 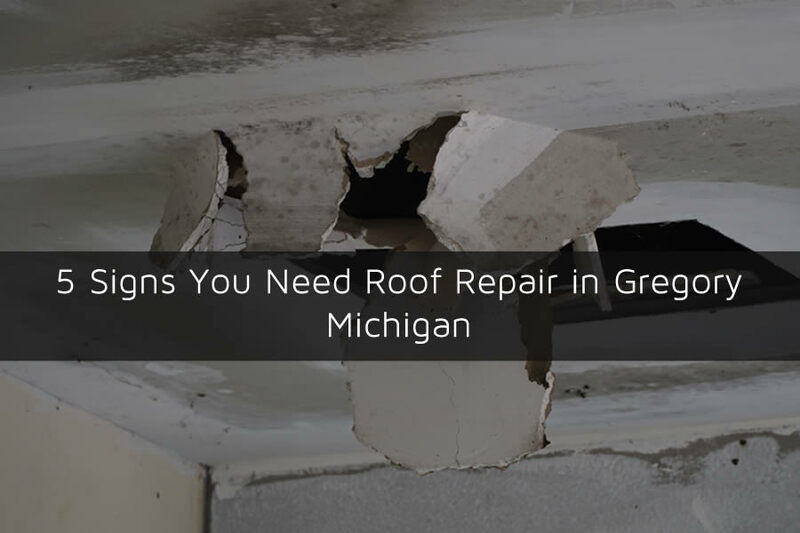 When a roof starts to leak there are usually some clear signs that you can look for on your home and if you see any of these signs getting roof repair in Gregory Michigan will be needed in order to stop the roof leak before more damage to your home can occur. Although I have listed 5 of the top signs of roof damage below there are a few other which aren’t as common. Most of the problems listed below are due to the age of the roof getting older and storms that can damage the roof. As high winds and rain pick up during more severe storms the threat of damage to your roof increases especially on older roofs. The following tips are also listed for asphalt or fiberglass shingle roofing materials which are very common in the Gregory Michigan area. When water enters the home through a roof leak it will first affect the attic and attic insulation of the home. As more and more water enters the home it will cause the insulation in your home’s attic to become saturated with water. This saturated insulation will become very heavy as more water leaks in. The next place the water will affect will likely be your ceilings and the tops of walls in your home. The insulation will hold water against the drywall in your home’s ceiling saturating it. When this occurs the drywall on the ceiling will begin to show signs of moisture and usually a tell tale sign is a brown discoloration in the ceiling. If you notice this brown discoloration on the ceilings or tops of walls in your home you’ll need roof repair in Gregory MI. Sometimes the roof leak is very obvious even if the home isn’t showing signs of a roof leak. When trees or branches fall on the home and damage the roof getting it repaired before it rains again can prevent damage to your home. You may also notice damage from storms or wildlife which are typically easy to spot on the roofing surface. When storms with high winds affect your home it can damage the roofing surface. One way these high winds damage the roof is they blow the shingles up and break them. Once this break occurs the shingle doesn’t usually fall into the same place and it leaves a discoloration on the roofing surface which is usually very dark or very light. These spots are likely to be square in appearance. Usually older roofs will have damage of this nature although new roofs can be susceptible too if the storm is bad enough. Sometimes during these storms with higher winds the shingles can actually be broken and blown completely off the roof. You may find bits and pieces of shingles around your home on the ground. If you live close to neighbors be sure to inspect the pieces of shingles to ensure they are the same color as yours and not someone else’s roof that just landed in your yard. Some of the more common places that a roof leak will develop is not on the roofing surface but on the roofing components. Things like skylights and chimneys are two problem areas. Look for signs of water damage around these items such as discolorations or a black mold looking substance. If you notice either be sure to get a roof inspection done on your home. If you suspect there is a problem with your home’s roof be sure to call Livingston Roof Pros today at 517-940-8770. We offer roof repair in Gregory and surrounding areas. Plus, we offer free estimates on all of our roofing services here at Livingston Roof Pros.